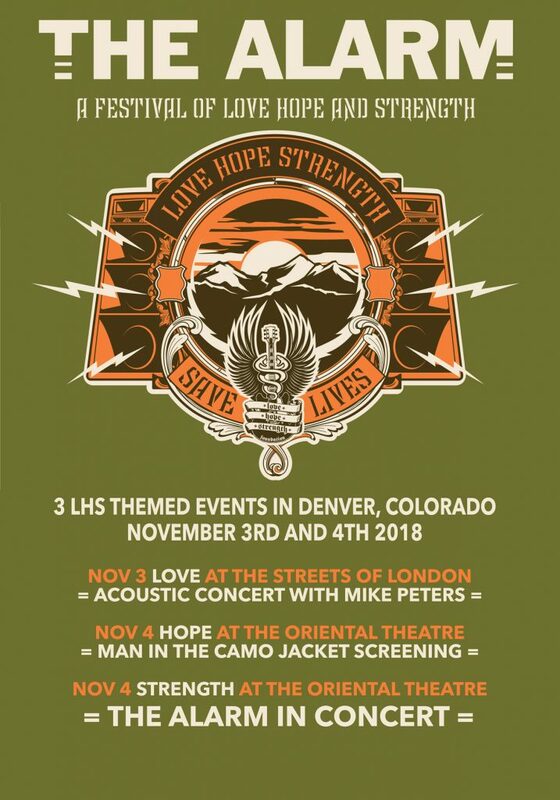 The Alarm are joining forces with the Love Hope Strength USA on November 3rd and 4th 2018, in Denver, Colorado, to host a festival of Love, Hope and Strength themed music concerts and film showings, that will celebrate and support the life saving achievements of the charity that took it’s name from co-founder and cancer survivor Mike Peters’ classic Alarm song ‘Strength’. With over 170,000 people registered to the international bone marrow registry and some 3,500 lives potentially saved, The Love Hope Strength Festival weekend will feature a finale concert at The Oriental Theatre (Sunday November 4th), by Welsh Rock band The Alarm, who will present some of their best known songs alongside music from the brand new and critically acclaimed album ‘’Equals’. The weekend will also feature a Mike Peters acoustic ‘solo’ performance at Denver’s ‘Streets Of London’ (Saturday November 3rd), and a special screening of the award winning movie Man In The Camo Jacket (November 4th at the Oriental Theater), which tells the incredible story of both The Alarm and Love Hope Strength. All in all, this one of a kind Love Hope Strength Music and Film Festival Weekend with special guests Mike Peters and The Alarm, promises to be a highly charged and emotional event offering a rare opportunity to take part in something truly special. So don’t delay, order your tickets when they go on sale exclusively to LHS supporters first on July 20th. Tickets go on sale on this Saturday 21st July 2018. Address: 1501 E. Colfax Ave.